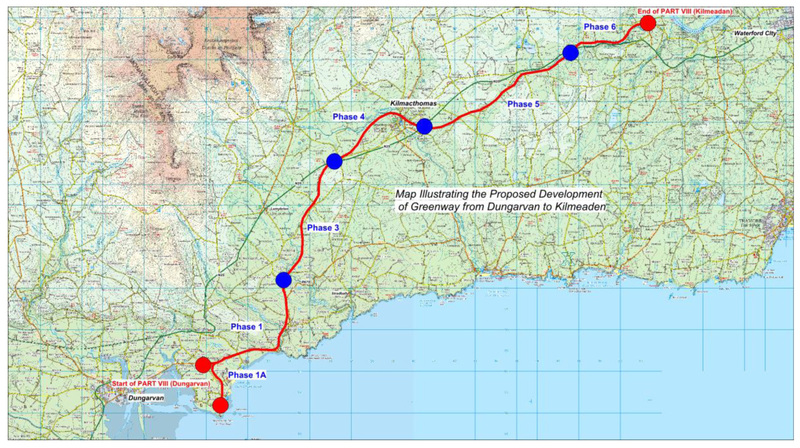 Dungarvan to Kilmeaden Greenway route map: Phase 1 and 1a have funding – click image to enlarge. Image by EarthRoute Ltd and included as part of the planning files. Waterford councillors have unanimously voted to approved plans for a 31km greenway between the seaside town of Dungarvan and Kilmeaden, south of Waterford City. The route — called the Deise Greenway — is to be built on the former Waterford-Dungarvan railway line. It follows the news last week that Waterford County Council received €897,739 for the 7.2km Clonea section of greenway — which makes up phase one and two of the route (pictured). The last train services ran on the line in the early 1980s, but unlike the route of the Great Western Greenway, most of the route remains in state ownership. Landowner permission was needed for most of the Great Western Greenway and that has caused some disruption issues since its opening. The public consultation has now ended, however Part 8 planning files can still be viewed on Waterford County Council’s website. See here for details. Might have to move to Waterford! The place that cares about cyclists.